Has it been awhile since your last exhaust system cleaning? You could have a fire code violation on your hands. Plus, you may be putting your restaurant at risk of serious damage from a grease fire. You can trust Flue Steam to provide the thorough restaurant kitchen exhaust cleaning in Dana Point CA you need to satisfy code inspectors, eliminate fire hazards, and keep your kitchen smoke- and odor-free. 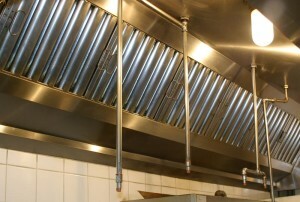 We offer two methods of restaurant kitchen exhaust cleaning in Dana Point CA, hand scraping and steam cleaning. Hand scraping is an affordable way to remove greasy buildup from the areas where it accumulates the fastest, namely your exhaust hoods. This service is usually needed about once per month. Steam cleaning is a more thorough process that uses hot water to remove grease from the entire exhaust duct system. Most restaurants need this service 2 to 4 times per year. After providing service, our technicians will provide you with a Certificate of Performance sticker. This will be very helpful for your records as well as for satisfying code inspectors and even helping you to save money on your insurance. Exhaust fan inspection: Without a working exhaust fan, hot greasy air will linger in your kitchen. That’s why whenever we provide restaurant kitchen exhaust cleaning in Dana Point CA we also take the time to carefully inspect the exhaust fan and recommend any necessary repairs. Whether it’s time for a routine cleaning or you need an emergency restaurant kitchen exhaust cleaning in Dana Point CA, you can count on Flue Steam. We can have a crew at your restaurant ASAP. Please call 800-700-FLUE now to schedule service.